Reading Time: 1 minute This is a collection of 52 cards from Board of Innovation, Belgium, to help you brainstorm and come up with new ideas. Use them as a catalyst for smarter, more unique ideation sessions. 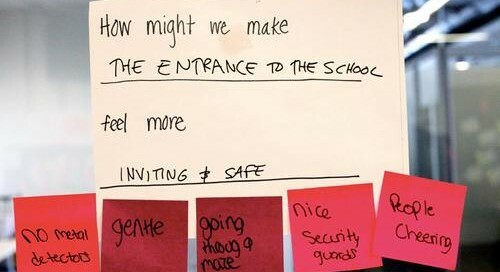 Reading Time: 3 minutes How-Might-We Questioning is a format to reframe issues in opportunity statements to spark creativity, brainstorming, and innovation: How might we make our entrance more inviting that our visitors feel more at home. How-Might-We Questions are a simple way to improve your products or services. In design thinking, HMW questions open up to Ideation sessions where you explore ideas, which can help you solve your design challenge in an innovative way. In product development and engineering, How-Might-We Questioning is a simple way to improve products or services. Reading Time: 1 minute Kreativitätstechniken und Kreativitätsmethoden lassen sich grundsätzlich in intuitive und diskursive Ansätze aufteilen. Intuitive Ansätze liefern in kurzer Zeit sehr viele Ideen. Sie fördern Gedankenassoziationen bei der Suche nach neuen Ideen. Diskursive Ansätze dagegen führen den Prozess der Lösungssuche systematisch und bewusst in einzelnen, logisch fortschreitenden Schritten durch. Dieser Artikel stellt mehr als 20 Kreativitätstechniken und Kreativitätsmethoden vor. Reading Time: 1 minute Innovation Portal. Reading Time: 1 minute 27 Creativity & Innovation Techniques. 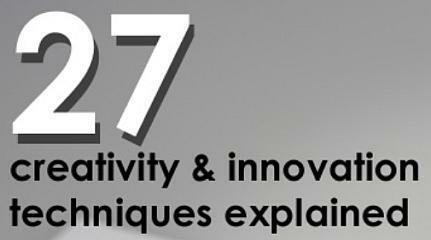 27 creativity & innovation tools is an overview of various commonly used techniques in creativity, innovation, research & development processes. All in one-pager. The techniques are grouped by Diverging & Converging techniques, Open & Closed challenges / problems, Products & Services situations, Individual & Group techniques. Reading Time: 1 minute Innovation Games are collaboration frameworks that you can play online or in-person with your colleagues and customers. Innovation Games help you to accurately predict what customers want, need, and will pay for. Reading Time: 1 minute Gamestorming - A toolkit for innovators, rule-breakers and changemakers. Gamestorming is a set of co-creation tools used by innovators around the world. Reading Time: 1 minute Board of Innovation. Belgium Innovation consultant company shares free, hands-on, easy-to-use, actionable innovation tools. Reading Time: 1 minute DesignPilot. Web application (Android, iOS, Windows) created by Hochschule für angewandte Wissenschaften Coburg, Fakultät Design. The TOOLBOX is public accessible web space with currently 172 tools for product development and 77 creativity techniques (in German only).